Come one, come all! Zelda Versus, our high-stakes tournament series, has returned! You, our valued readers, once again have the chance to cast your votes on a certain aspect of the Zelda series and so decide the best of the best. It’s Ocarina of Time Week here at Zelda Dungeon, and our tournament this time around should act as the perfect vehicle to celebrate the Nintendo 64 classic. Ocarina not only introduced us to the first 3D version of Hyrule — a massive and impressive game world, indeed — but it also introduced a cast of characters that have stood the test of time as some of the series’ most beloved. And arguably, the most important characters in Link’s quest through time were the seven sages. These sages play a key role in Ocarina of Time, guiding Link through the many stages of his adventure and proving to be solid companions along the way. Our hero meets each of these characters as a child, and he later helps them awaken to their own destiny as an adult. The relationships forged thought OoT‘s narrative prove just how significant these particular sages are in the entire Zelda series. 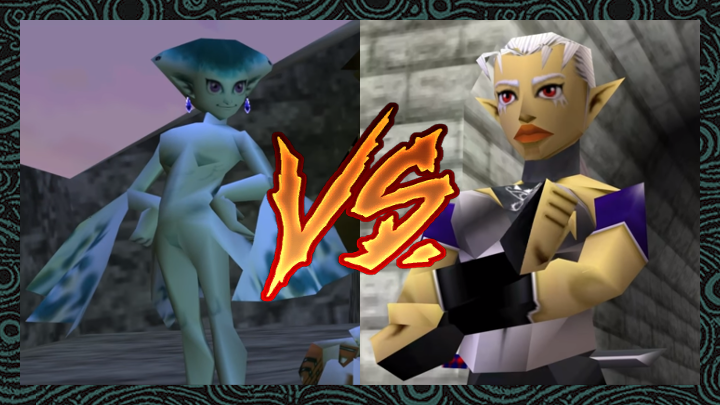 But which Ocarina of Time sage is the best? We’re deciding just that in this new Zelda Versus tournament. For the next few weeks, you can help us determine a winner by voting in a series of polls. Round 1 will see six of the seven sages take the spotlight, with the seventh awaiting a challenger in Round 2. But why does one competitor get a bye in the first round? Well, just like in Ocarina of Time‘s story, Princess Zelda isn’t embracing her role as a sage until the others have had a chance to strut their stuff. But that’s enough blabbering out of me. Let’s get to our first match-up! Ruto, the Zora Princess, makes quite the impression early in Link’s adventure. Having been swallowed by Lord Jabu Jabu and thus trapped in his stomach, Ruto tasks Link — quite assertively — with escorting her to safety. Ruto proves to be headstrong and sassy, quick to scold our hero when things don’t go her way. But when the present crisis of Jabu Jabu’s Belly is overcome, Ruto quickly warms up to Link and basically manipulates him into an engagement. Seven years later, our dashing hero once again meets the Zora princess, who despite a fair share of maturity hasn’t forgotten her betrothal. While Link and Ruto’s relationship doesn’t develop too much after the Water Temple, the Sage of Water continues to stick in the memories of Zelda fans. Her enduring popularity, including a few references to her in Breath of the Wild, shows just how important Princess Ruto is to the greater Zelda series. Incarnations of Impa existed in both the backstories of The Legend of Zelda and The Adventure of Link, but Ocarina of Time was the first time the character really came into her own. Cunning, skillful, and wise, Impa is the bodyguard of Princess Zelda and a trusted ally of the Hyrule Royal Family. Seemingly the last in a long line of Sheikah warriors, she plays a key role in the Ocarina‘s story and setting, having established Kakariko Village as a thriving community, aiding Zelda and Link in their early attempts to thwart Ganondorf, and later teaching the Princess in the secret arts of the Sheikah. Then, after seven long years in hiding, Impa returns as the awakened Sage of Shadow with the purpose of watching over the village she once built. Ocarina of Time‘s Impa is the reason why versions of the character continue to pop up in Zelda titles to this day. If she hadn’t been as strong as she was, we may not have seen further incarnations in future games. We will post a new Round 1 voting page on Wednesday and Friday. On Sunday, we will post a wrap-up article explaining the results of the prior week.